Jack's Abby House Lager hit the shelves of Florida in the past few months, one of a handful of beers Total Wine brought here on their Brewery Direct program. Honestly, I wasn't that happy with the styles in the four options, an IPL, an Imperial IPL, an Octoberfest and this House Lager. But I love the program so wanted to support it by checking it out. 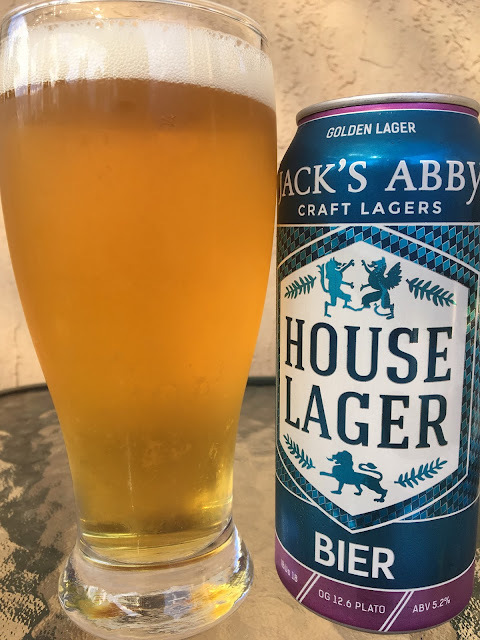 House Lager came in a pounder can, 5.2% alcohol, 18 IBU. Canned 08292017, and I drank it within a month of that. Grainy sweet aroma, not too powerful. Rich, grainy sweet flavors to start, with some additional honey sweetness. Toasty background is nice. Perhaps a hint of floral flavor. But there is a serious lack of bitter balance. Probably was negative 18 IBU. Good flavor, but needs to have some bitterness and I would have loved some prickly carbonation to enhance that! Pass.